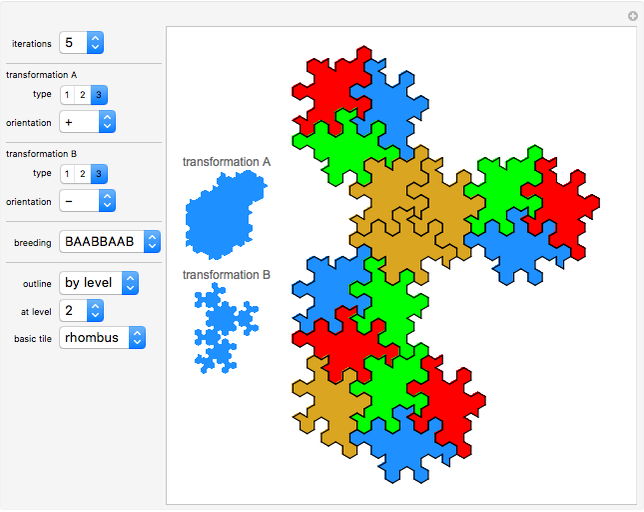 This Demonstration lets you display a large variety of substitution tilings made of congruent tiles that can approach fractal boundaries. This Demonstration deals with frac-tiles of order four, based on the selected transformation rules involving unit translations, rotations of 60 degrees and/or reflections. Frac-tiles are plane figures that, at their limit, can be dissected into smaller congruent figures and/or their reflections. 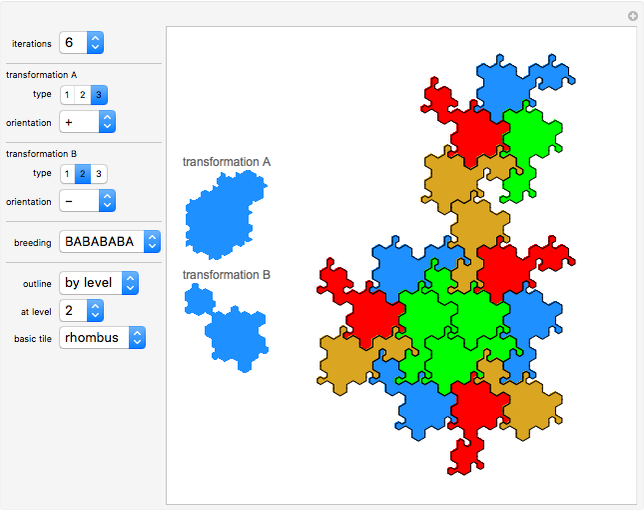 This makes them rep-tiles with fractal boundaries. Order four refers to the minimum number of congruent figures needed to divide the frac-tile. 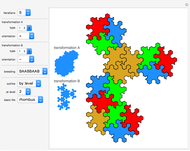 Frac-tiles can be generated by iteration using rules that determine the location and orientations of the component shapes. Using this method, one can start with a simple component shape: in this Demonstration, use the "basic tile" popup menu to select "rhombus" or "comma." The final iterated shape is independent of the basic tile. The starting shapes are not arbitrary, but other shapes such as a hexagon are possible. Note that all the intermediate iteration shapes are valid starting shapes. The code allows generation of numerous transformation rules that are compatible with the same simple starting shapes, and generally speaking, with any of their intermediates. 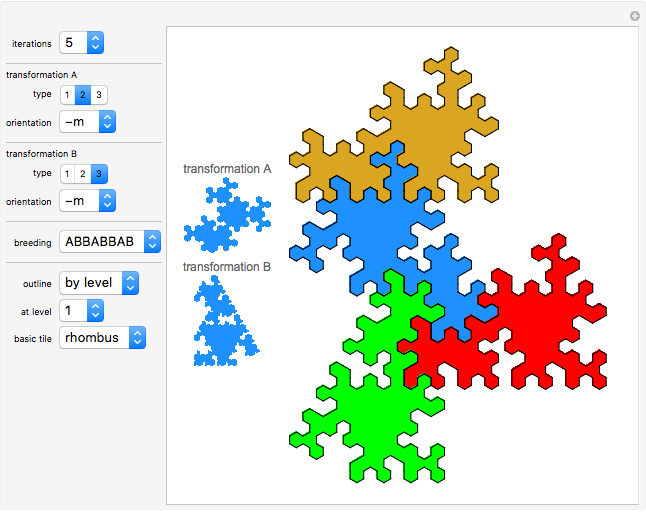 The rules are generated from the selections made for transformations A and B. The result for each, after four iterations, is shown at the left edge. To see the result of a single transformation at more or fewer iterations, use the "breeding" popup menu to select "A only" or "B only" to see the main result. The compatibility of the starting tiles for the transformations allows interpolation of the frac-tiles by breeding the transformation rules. If the interpolation recipe is -cyclic, the result will be a frac-tile of order ; otherwise, the resulting fractal is not a frac-tile. This Demonstration allows selection of various sample breeding recipes between the two selected transformation rules. The dissected tile outlines can be shown up to level 5, and the original tile shape can also be selected. A few combinations of "type" and "orientation" result in identical rep-tiles, but in the breeding they may produce different results. More transformation rules than used in this Demonstration are possible, especially when unconnected tiles are allowed. Breeding recipes could also mix more than two transformation rules, but the code allows definition of just two rules at a time. Since any of the given rules could be applied at any level, an enormous number of different fractals are theoretically possible. 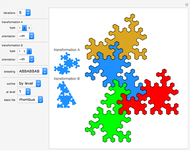 Only approximations of fractals can be visualized. For a theoretical fractal, the number of iterations has to approach infinity and a recipe of infinite length would be needed. However, computational resources would soon run out, so we must be content with using our imagination. Dale Walton "Factory for Frac-tiles of Order Four"